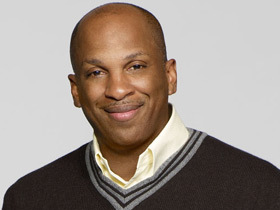 KIM LAWTON: Donnie McClurkin is a Gospel superstar whose voice is recognized around the world. But on Sunday mornings, as Pastor McClurkin, he has more local concerns -- like the parking problems in his church's neighborhood. Pastor DONNIE MCCLURKIN (Perfecting Faith Church, at pulpit): You want to be mindful of Zack's Delicatessen across the street also. You can park around there, but don't block the front door entrance because they have a problem with the clientele getting in. Amen? LAWTON: This Grammy award winning artist may sing for presidents, but he's known for "being real." And whether in his local church pulpit or on a stage before thousands, he preaches a forthright, often-provocative message about his troubled past, his struggle with homosexuality, and his faith in God. Music, he says, is his sermon. Pastor MCCLURKIN: You won't find a major religion in this world that doesn't use music, because the truth of the matter is that music comes from God. I don't understand it to this day, but music goes past the soul, goes past the emotions and gets into the spirit of a man and can bring him to his knees. If you ever want to get anybody in touch with God, sing to them. LAWTON: McClurkin has sung for millions. His three solo albums have topped the Billboard charts and Gospel and secular R&B play lists. In 2003 he won a Grammy for his CD, AGAIN. He credits Oprah Winfrey with promoting his hit single, "Stand." Pastor MCCLURKIN: She said, "Donnie, has this CD gone gold yet?" And I said, "No, No." She said, "OK." She stood on television and said, "You've heard me talk about Donnie McClurkin before. This is a voice that you've got to reckon with, and this is my favorite song." Two weeks later, the thing went gold. 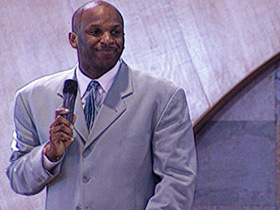 LAWTON: McClurkin wrote the song "Stand" in 1996, after having what he calls "a meltdown with God." He was on a red-eye flight, feeling exhausted and frustrated that God didn't seem to be answering his prayers. The song that became his signature came to him, he says, in about 20 minutes. Pastor MCCLURKIN: He'd allowed me to have a temper tantrum on a plane so that a whole entire world can be, you know, ministered to by a song. Why he does that I don't know, and when I get to him, I'm going to ask him. LAWTON: Much of McClurkin's music comes out of his personal experience and his own pain. His happy early childhood ended abruptly in 1968 when he was eight years old. His two-year-old brother was hit by a car and killed. The night of the funeral, McClurkin's uncle raped him. His family was torn apart by drugs, alcohol, and violence. McClurkin found solace in the church. Pastor MCCLURKIN (from documentary, "The Story of Donnie McClurkin"): I received Jesus in that church right there, on a Sunday morning, July 14, 1969. LAWTON: He was particularly drawn to the music of the church. Pastor MCCLURKIN: I was always introverted. I was the guy that was scared of crowds, that was inferior. I had such an inferiority complex, and the only way that I could really depict any feelings or any emotions was through music. LAWTON: When he was 13, McClurkin says he was raped again, by his cousin. That led to a 20-year-long battle over his sexual identity. Pastor MCCLURKIN: My desires were toward men, and I had to fight those things because I knew that it wasn't what we were taught in church was right. LAWTON: McClurkin says that through Bible study and intense prayer, he has overcome his homosexuality. Pastor MCCLURKIN: God gave me the wherewithal to get out of that and to find out who I really am and, consequently, that's how the change took place. 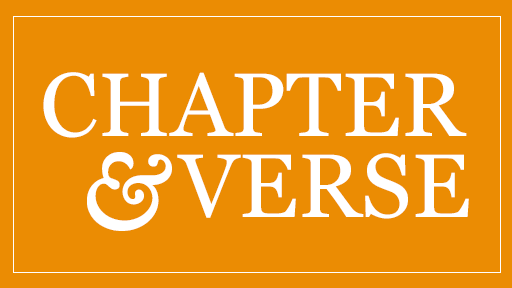 The different scriptures in the Bible, his will being shown through the scriptures -- God walked me through it. LAWTON: His comments have provoked a firestorm of controversy, particularly from gay rights groups that are offended by his belief that homosexuality is something that can be chosen or "overcome." McClurkin insists he's not condemning anyone, but he makes no apologies for his beliefs. Pastor MCCLURKIN: There's a group that says, "God made us this way," but then there's another group that knows that God didn't make them this way. And for those that are looking for that exit -- there are those of us, and I'm not a lone wolf -- there are many more that can tell that God did it for us, and he will do it for them. LAWTON: He's also open about his continuing sexual struggles. He fathered a child out of wedlock five years ago. His hit song "We Fall Down" talks about the frailties of saints and sinners alike. Pastor MCCLURKIN: You know, I don't understand where the hypocrisy comes in so heavily in Christianity. And it angers me in a way, because the bottom line is, if you mess up, just say, "I messed up." Don't cover it up and act like, you know, I'm too pompous and pious to say that I've done wrong. No, if you are a preacher and a pastor or a minister and you mess up, just come clean. LAWTON: McClurkin is head pastor at Perfecting Faith Church, a nondenominational Pentecostal church in Freeport, New York. The 1,000-plus congregation meets in a former supermarket. He's home for the services every Sunday unless he's traveling overseas. Services there are exuberant and interactive. Church members are likely to be dancing in the aisles, speaking in tongues or lying on the floor, overcome by the Holy Spirit. While many Gospel artists have been accused of abandoning their religious roots after they hit it big, McClurkin is emphasizing his roots all the more. Pastor MCCLURKIN (at BET Awards): 'Cause I'm telling you, I'm nothing but a glorified church boy. That's all I am. LAWTON: His new CD, "Psalms, Hymns and Spiritual Songs," is all praise and worship music recorded live at this concert in Virginia. Pastor MCCLURKIN: So much of what we do is industry driven, but there comes a time when you've got to know your audience, and you've got to know where you really function best, and you've got to take the chance. LAWTON (to Pastor McClurkin): Has success brought new challenges for you? Pastor MCCLURKIN: Celebrity has its pros and cons, but what celebrity has afforded me is a greater platform to declare the very message that has changed my life. I don't want to be larger than life. God's chosen that I am for his purposes. (from documentary, "The Donnie McClurkin Story," on tour bus): Welcome to the world of touring. Welcome to Donnie McClurkin's world. LAWTON: McClurkin, who is still single, says he stays grounded by surrounding himself with family, including several of his sisters who sing backup for him. Music, he says, helps keep his relationship with God fresh. Pastor MCCLURKIN: There are certain songs that open up another illumination to how great God is, that would reduce me to tears, you know? There's a song that says, [singing] "Sweet hour of prayer, sweet hour of prayer that calls me from this world of care." Those songs reduce me to tears. At the end of all the accomplishments, I've got to be that little boy -- the one who was broken, realized his own lack of self-worth, that depended on God in the beginning; the one that depends on God now. If you want to know who I am, I'm Donnie McClurkin, a nine-year-old boy who met God. That's it. LAWTON: I'm Kim Lawton reporting. 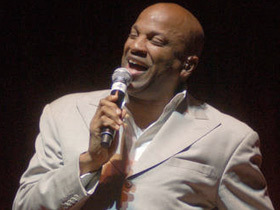 Donnie McClurkin is a Gospel superstar whose voice is recognized around the world. But on Sunday mornings, as Pastor McClurkin, he has more local concerns — like the parking problems in his church’s neighborhood.